Keep track of your tack! We've selected a variety of plates to keep all of your tack organized. Included with all of our plates is the appropriate mounting hardware. 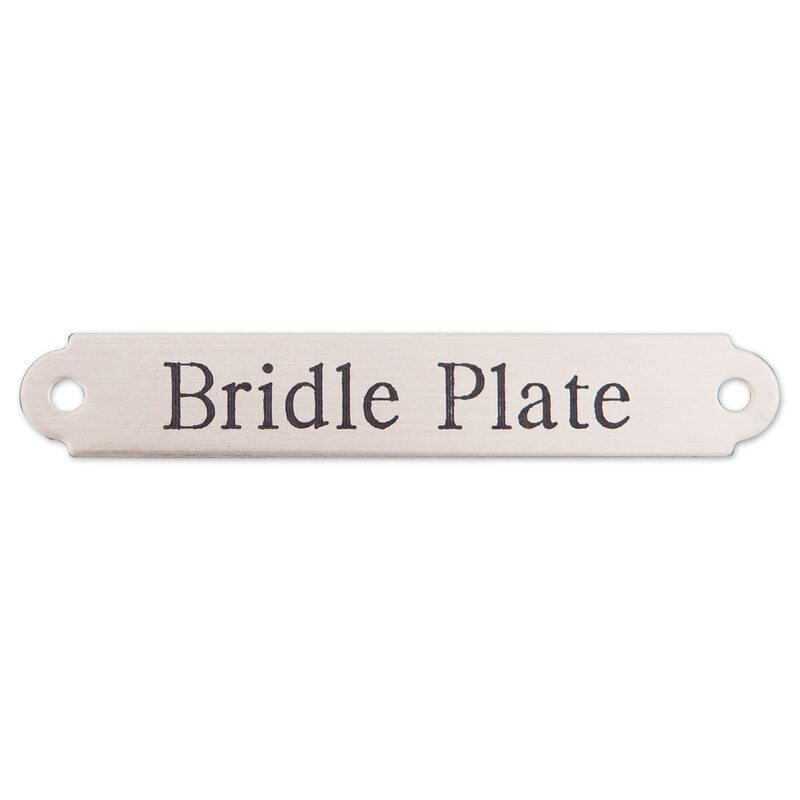 Our Bridle, Martingale, & Girth Nameplate comes with 1/4" rivets. A classic plate in satin brass or nickel silver, available in two sizes to suit your needs. Standard size fits most Horse and Warmblood Bridles, as well as Pony Halters. Small size is suitable for most martingales. Please refer to measurements below to select which size is best for your needs. 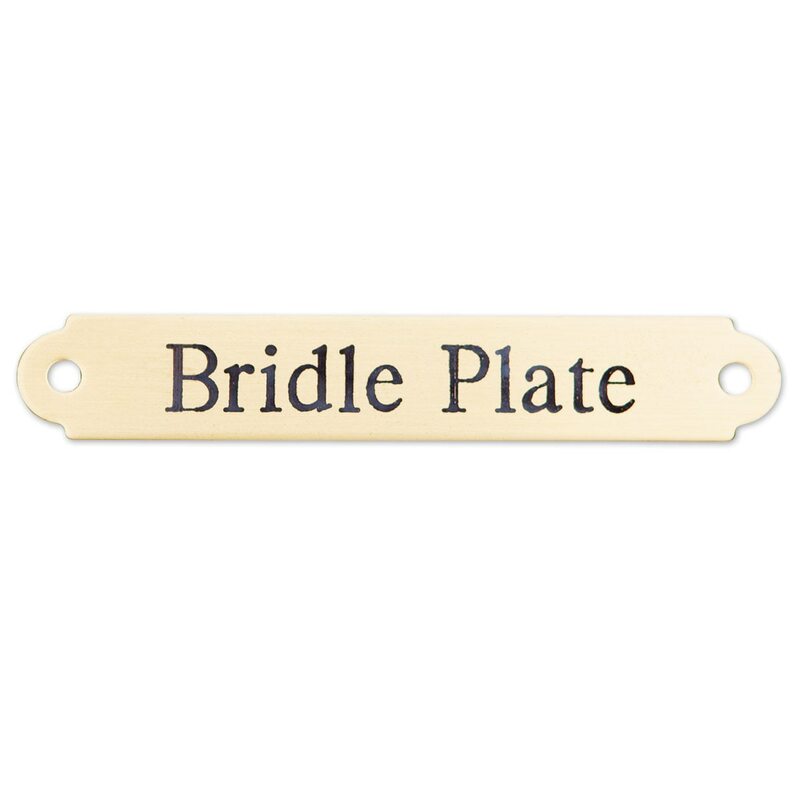 Standard measures 3"x ½" and Small measures 2 1/2" x 3/8"
Nameplate - Bridle, Martingale & Girth is rated 4.0 out of 5 by 148. Rated 4 out of 5 by Ksloan from Looks great, perfect size BUT These look great and arrived super fast. The small size is perfect for martingales and small bridles. However, I received the wrong hardware (receiving ends) so am unable to attach the nameplate. I was sent extra but unfortunately they are all the wrong size. Rated 5 out of 5 by Sarah from Looks amazing! This product looks amazing, it was easy to install, and around a year later it still looks amazing and holding strong! Everyone always loves how I have a nameplate on my headstall. Rated 4 out of 5 by Tcc74 from Girth Namelate Nice but should include longer posts for thick girths. Rated 2 out of 5 by Heather from Bigger than expected I had purchased the small bridle nameplate for my horse's new bridle and when it came I was surprised to see just how big it was. It is the same size as the nameplate I have on one of my saddles. I am a little disappointed as I was expecting a much smaller nameplate. Sad to say I won't be putting it on my bridle as I think it will look weird. Also, when it arrived it came in it's own box separate from my order and the box was huge for just one nameplate. It could have easily been sent in an envelope. It was a nice nameplate otherwise. Just keep in mind that they aren't the usual smaller ones that go behind the ear. I think these would work better for a breastplate or martingale or something like that. Rated 1 out of 5 by Bina from Dissapointed Someone left a review about how the hardware is too large to fit into the bridle plate holes. This definitely was the case. There was no way to even hammer the hardware in as it was just too big. I also already drilled holes into my beautiful new bridle that I had just purchased from this site. I am very upset and taking it to a professional who can hopefully cover the holes but it is not looking good. Very unhappy with this product. I thought it would be great as I had ordered one of these for my halter and it worked well. Rated 5 out of 5 by pasture puff from Classic look I love the smaller size of these plates, but the regular size is huge for bridles and martingales, IMO. The smaller size seems to be the classic look. Rated 5 out of 5 by meackles from Excellent quality at great price I have purchased these plates for my bridles and martingales and LOVE THEM. Word of advice: if you want the traditional "bridle plate" that is done on the side, behind the ear, order the "small" size. I found the Large to be more like a Halter plate. Small size is perfect for a bridle and martingale. Super easy to install yourself too.